and when they do, you run with them! 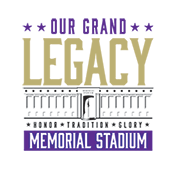 The Memorial Stadium Project is an opportunity for you to honor past tradition while leaving a lasting legacy to impact generations to come. By choosing one of the three options below, you have the ability to give in a way that is most convenient for you, while investing in our community’s future. Thank you for your generosity and helping us give our community home field advantage!